If you're the type of person who cares about the quality of food they put in their body and loves eating healthy, but also likes the opportunity to save money on expensive ingredients, then you'll love what Thrive Market has to offer. Thrive Market brings you only organic, non-GMO food to at wholesale prices and they've recently become an official sponsor of Charity Miles! This guide will help you understand what they do, how it works, why you'll love it and who will really benefit from our new partnership. 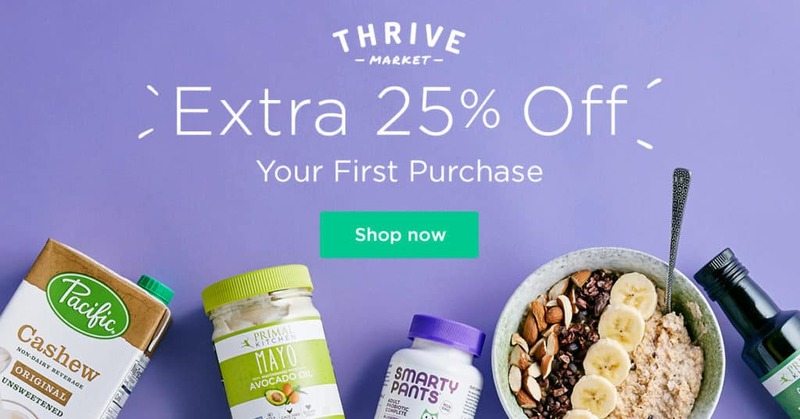 Thrive Market curates the highest quality organic, non-GMO products (food, beauty, cleaning supplies) for you to shop from at 25% – 50% off retail prices by selling it to you wholesale. They pass the savings to their customer in exchange for a simple annual membership of $59.95. If you don't save at least $60, they'll give you the difference in credit at the end of the year after you renew. Thrive Market is an online membership store that provides a bountiful variety of all organic, non-GMO, sustainably sourced products. Items you would find in your kitchen pantry, freezer, medicine cabinet, nursery and cleaning closet are all available for delivery right to your front door. They save you 25-50% off retail prices for the same items at other stores. They do this by selling you the products at wholesale in exchange for a simple $59.95 annual membership. It works a lot like Costco, but if Costco sold ONLY organic, non-GMO, sustainably sourced foods, health products, and items for your home. If you would pay an annual membership fee to ensure the lowest price to purchase these types of products and have them delivered directly to your door, read on. When I started my account, I searched for my items based on category, dietary guidelines and by member favorites too. What really impressed me was the availability of a Thrive brand line of organic and non-GMO products that members seem to love. That made it easy to want to add Thrive products to my cart without worrying about their quality. If I didn't like something, I could just let Thrive know within 7 days and I would get a full refund. (But I loved everything). Of course, some items, such as perishables, sanitary goods, digital downloads, and final sale items are excluded, but that is no different than it would be at a local store. Who Buys Groceries Online Anyway? Did you know that nearly 50% of Americans now buy groceries online, according to new research from the Food Marketing Institute (FMI). Options are growing and include retailers such as Thrive Market, Amazon, and Instacart. What makes Thrive Market so unique is that they only source REAL, healthy, non-GMO, and organic foods so you know that you’re getting the best. And, unlike Amazon, and other online grocers, you’re getting wholesale prices. But you still need to value healthy foods. Thrive Market isn't for someone who is looking for cheap, generic foods that make up much of the Standard American Diet (SAD). Beyond the healthy products and saving money, I love the convenience and I feel I'm buying back my time! No more trips to the grocery store for me! Something else that really inspires me about doing business with Thrive Market are the charitable deeds. Thrive Gives is the department responsible for gifting a membership to a low-income family, teacher, firefighter or veteran in need for each membership purchased. So when my free trial membership expired, it felt fantastic knowing that when I paid my $59.95 annual fee that someone else that needed it would be awarded the same privilege! 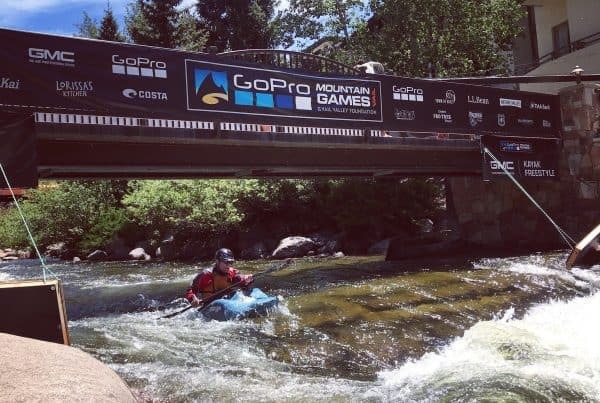 After I watched the video below about one family who was awarded a membership scholarship it made the decision to purchase my membership even easier. 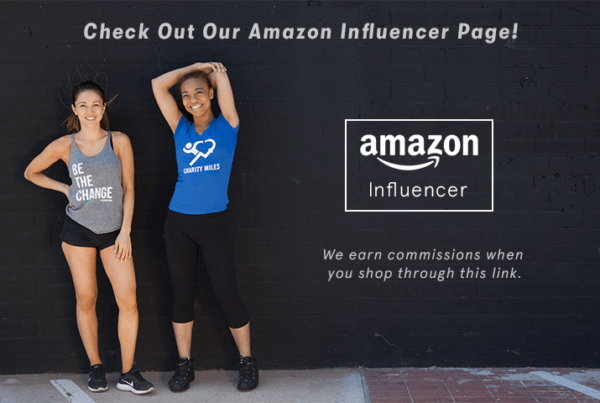 Is Thrive Market Worth the Membership Fee? While I can’t speak for your situation, I’d say for mine it makes complete sense. For starters, I paid the fee knowing about Thrive Market’s happiness guarantee that basically says if I don’t end up saving at least $60 a year with what I buy, they will make up the difference upon my renewal date! Next, I did a little investigating on those price savings myself. I figured the best place to make that comparison is with the cost for like items using Amazon since it’s an online store also. I made sure to use the regular lowest price on Amazon that was not the Pantry subscription, so this could be a valid side by side evaluation. I searched for items I needed for my pantry, which tended to be some of the Thrive member favorites too. My goal was to restock some essentials as well as get my order to $49 to enjoy free shipping. Here’s what I found. To my surprise, every single item I added to my Thrive Market cart cost less than it did on Amazon. My Amazon total for this order would have been $112.12. That said, just by being a member of Thrive Market, I’ll get free shipping for this order (which will likely ship within 2 days as 85% of all orders do so, by the way) and save over $23.00 and close to 21%. As mentioned, Thrive Market is now a premiere sponsor of Charity Miles. Doing good for myself while doing good for others just feels good. Being peas in a pod with companies like Charity Miles makes perfect sense. 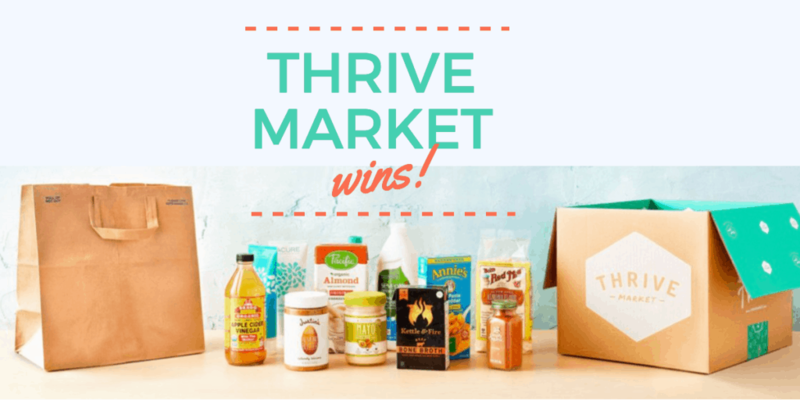 Does Thrive Market’s mission ring true for you? If you’re ready to realize savings for items you buy regularly, and you’d like the convenience of having them delivered right to your door, be sure to check out the 30-day free trial membership yourself. Save an additional 25% on your first order too. Click below to get started. Or enter the September Thrive Market Giveaway here.